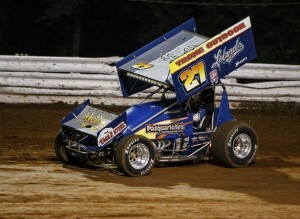 Selinsgrove, PA — (September 13, 2014) — Fourth-place starter Greg Hodnett of Thomasville stormed into the lead at the drop of the green flag and wired the field for a convincing victory in Saturday night’s 44-lap Jim Nace Memorial 32nd Annual National Open for 410 sprint cars at Selinsgrove Speedway. The $12,000 flag-to-flag win at the wheel of the Lelands.com No. 27 was Hodnett’s first of the year and 15th career at Selinsgrove and 10th overall this season in 410 sprint car racing. Hodnett joins Todd Shaffer of Millerstown as four-time winners of the Open. Pat Cannon of Etters, who was attempting to become the first driver to win the Open four years in a row, finished in the second position. Danny Holtgraver of Pittsburgh was the night’s Fast Tees Fast Qualifier with a lap time of 15.991 over the 28-car field. Jeff Rine of Danville scored his sixth win of the season in the 25-lap super late model feature. The victory was Rine’s 91st career at the track and strengthens his points lead over Steve Campbell of Danville in the close chase for the championship. The start of the racing program was delayed by 90 minutes while the track crew prepped the saturated speedway surface from rain showers that ended about 2:30 p.m.
Selinsgrove Speedway will present the final points race of the season for the 360 sprint cars, late models, pro stocks, and roadrunners at 7 p.m. Saturday, Sept. 20. The 14th Annual Mach 1 Chassis National Open for 360 sprint cars will close out the season at 7 p.m. Saturday, Sept. 27. On the start of the sprint car feature, fourth-place starter Greg Hodnett pulled off a breathtaking move using the highline off turn four to take the early lead while second-place starter Justin Barger and polesitter Danny Holtgraver held down the top three positions. By lap five, Hodnett was already beginning to encounter slower traffic as he soared around the half-mile oval at breakneck speeds. A lap seven caution flag for a flat tire on Steve Buckwalter’s car regrouped the field. On the ensuing restart, Hodnett quickly stretched his lead again over the field. On the ninth circuit, 16th-place starter TJ Stutts flipped wildly out over the fourth turn guardrail. Stutts escaped injury. When the race resumed, seventh-place starter Pat Cannon made an exciting drive around the top of the track in turns one and two to take over the third position. A lap later, Cannon stormed into the second spot and started gaining real estate on the leader. The caution flag unfurled again on lap 16 when Aaron Ott’s car blew a tire in turn four. On the lap 17 restart, 18th-place starter Lucas Wolfe powered into the top five and showed a lot of speed. The race was halted on lap 22 for a scheduled fuel stop. At the start of the second half of the race, Hodnett continued his dominating performance while Cannon struggled with lapped traffic. With 10 laps remaining, however, Cannon started to reel in Hodnett and at one point closed the gap to nearly 1.5 seconds. The final caution flag waved on lap 40 when Wolfe’s car rolled to a stop in turn four with a broken nose wing, ending an impressive drive from deep in the field. For the final four laps, Hodnett streaked around the oval and posted a 5.6 second margin of victory over Cannon, Holtgraver, Barger, and ninth-place starter Brent Marks. Second-place starter Tim Wilson powered into the lead at the start of the super late model feature. On the first circuit, sixth-place starter Tony Adams horsepowered his way into the runner-up position and set his sights on Wilson. The race’s first caution flag unfurled on lap nine when Jim Bernheisel’s car stopped in the second turn. On the lap 10 restart, 10th-place starter Jeff Rine advanced to second and chased Wilson for the lead. On the 15th circuit, Wilson’s car blew an engine and rolled to a stop in turn four. For the restart, Rine inherited the lead with Adams in tow. In the final laps of the race, Rine stretched his lead and posted a five-second margin of victory over Adams, polesitter Pancho Lawler, eighth-place starter Andy Haus, and seventh-place starter Bryan Bernheisel.